In the past eight and a half years of being vegan, I’ve met so many vegans or veg-curious people who have become interested in it through the seminal book, The China Study by Dr. T. Colin Campbell of Cornell University. This book broke ground on the impact of plant-based diet on health at a time when veganism was still considered radical and suspicious (2004!). 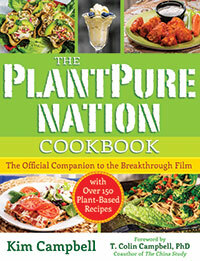 Dr. Campbell’s family has carried on the torch as his son Nelson has produced the film PlantPure Nation (together with the writer/producer behind Forks Over Knives), and Nelson’s wife Kim has written a companion book: The PlantPure Nation Cookbook. Wouldn’t you like to see what the royal family of veganism eat when they get together? I got the scoop! As that background would indicate, PlantPure Nation is firmly based on the idea that plant-based, dairy-free and animal-free diet is the key to vibrant health. Kim Campbell studied nutrition at Cornell, so she has thorough and research-based understanding of healthy, whole diet. But that doesn’t mean the book is dense–on the contrary, Kim makes both the underlying principles, and the flavors and concepts of recipes themselves, very accessible for anyone. Her down-to-earth approach is reassuring to anyone who, like herself, grew up on a traditional American diet. And you will not see any super foods more exotic than vegan staples like dates, molasses, and nutritional yeast. Yay for approachable recipes you can make from ingredients you already love! Kim also endorses a whole, unprocessed diet as the best for your health. She doesn’t doesn’t use any type of oil in her recipes for this reason–so if you are particularly interested in oil-free vegan diet, this cookbook will be a great tool. Instead of oil (or even virgin coconut butter), she uses whole nuts, nut butters, avocado, tahini, etc for healthy fats, and favors water saute method. This isn’t to say some of her recipes are not rich, creamy, and indulgent–because she does include a number of drool-worthy comfort food classics, like Spinach and Broccoli Enchiladas, Buffalo Beans and Greens, Cheese and Mushroom Stuffed Bagels (mmm! ), Reuben Sandwich. She also features creative and international dishes like Ethiopian Stew, Sweet Mayan Burrito, and Costa Rican Bowl. But one I’m going to try first is this decadent Vegan Mushroom Stroganoff recipe below! 1. Cook the wine, onion, and garlic in a saucepan over medium heat until the onion is softened, about 3 minutes. 2. Add the mushrooms and continue cooking for 5–6 minutes, or until the mushrooms darken in color, soften, and release liquid. 3. Add the paprika, soy sauce, Dijon, and Worcestershire sauce, stirring well. 4. In a small bowl, whisk together the flour and milk until smooth. Add the flour and milk mixture to the mushrooms and turn the heat to low. 5. Simmer until the mixture begins to thicken, 5–8 minutes. Add the chopped black olives, if using, and season with salt and pepper to taste. 6. Serve the stroganoff over brown rice. I would have liked to hear what you think of some of the particular recipes. Especially the mushroom stroganoff, which I made tonight. It was tasty, but tasted nothing like stroganoff. I’d have called it something else. It also had too much liquid. The enchilada casserole is very good though. I can’t tell from this review that you’ve actually tried any of the recipes, and that’s an important element of a review.